Kohei Uchimura has been widely considered as the best gymnast around since picking up the first of three consecutive world crowns in 2009 and if he performs well in London the Olympic title is his for the taking. But there is also something about his style and artistry that sets the man from Nagasaki apart from his rivals, and suggests that he will long be remembered. His talent was immediately evident and he was whisked to an elite club in Tokyo where he graduated to the national team in 2007 at the tender age of 18. In the national set up he was trained by 1984 Olympic champion Koji Gushiken, whose influence has been priceless. Standing at just 1.61m the diminutive Japanese was selected for the team at Beijing, where his potential was clear for all to see. He was to return home with silver medals in both the individual all-around and the team competition. 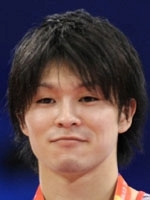 China's Yang Wei was the 2008 Olympic all-around champion, but Uchimura, who took silver due to two falls on the pommel horse, is unbeaten anywhere since that defeat in Beijing. He swiftly claimed a world individual all-around title at London in 2009 and followed it at Rotterdam in 2010 and at home in Tokyo in 2011 which made him the first man or woman to win three such consecutive titles in the history of the sport. Petar Sumi won in 1922 and 1926 for Yugoslavia, and China's Yang Wei followed him in 2006 and 2007. Russian Svetlana Khorkina won the women's title three times, but not in a row. At Tokyo he was in a class of his own, with a grace and fluidity rarely seen and he dealt a lesson in style to the pretenders, featuring some perfect landings and untouchably precise work. He won that title by a massive three points, a gulf in gymnastics, from German silver medalist Philipp Boy, also runner-up in 2010. Uchimura was the last to perform on the bar, but instead of simply making sure of gold, he wowed a capacity crowd of some 8,000 at the Tokyo Metropolitan Gymnasium with daring swings and aerial moves. "It is not the results that matter," said Uchimura. "My goal, indeed, is to perform in a way more beautiful than (Vitaly) Scherbo's routines," he said in reference to the Russian great. His rivals are mainly upgrading their routines for London, but Uchimura has no need, such is his margin. Fears of leg pain and a desire to hand his nation a team gold are the only clouds on Uchimura's horizon, but he cheers himself up by listening to Jennifer Lopez' hits in competitions, especially 'On the Floor'. The floor is his favourite exercise, and it also where he will likely leave his rivals in London.